Fundraisers – Whaley Pecan Company – Quality Fresh Pecans Since 1937! Since 1937, Whaley Pecan has provided superior pecans that will enable you to sell to customers who will come back for more. Many groups have sold Whaley’s Pecans for years and consistently order again year after year. 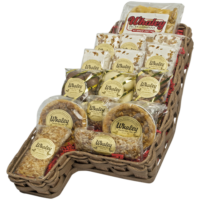 High quality, attractive packaging, and friendly service are a tradition at Whaley’s. Pecans are harvested annually starting around the third week of October. The yearly pecan harvest lasts until February or March. Our new crop prices are published each year as soon as we know what the new pecans will cost. New crop shipments begin as soon as possible after November 1st. 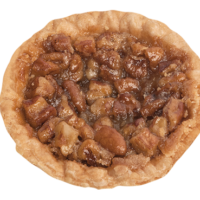 Most of our pecans are shelled and shipped during harvest; however, a portion of the best ones are shelled and kept at optimum freezer temperatures for prompt shipments throughout the entire year. For those who must have pecans from January to mid-October, order from our current regular price lists and specify your preferred shipping date. These pecans must come from freezer stocks on an availability basis. Freshness is guaranteed. New fall crop pecans may be ordered by phone, fax, mail, or email. Our new prices are usually available around mid-October and are mailed at that time. Demand is very high during the holiday season and many groups book their order early to be placed in line for shipment. As soon as we know exact prices, you group will be contacted for order conformation and approval to ship. Your order is processed and shipped as soon as possible. Be sure to check you order for completeness or damage when it arrives. If you have questions or damage, contact us immediately. All claims must be made within 10 days of receipt of shipment. Our terms are net 10 days to customers with established credit. A 1% cash discount is offered if check is sent with order. Please have person responsible for payment sign your order form.We also accept Visa, MasterCard, and Discover credit cards. Most groups add from $.75-$2.00 to the price of their pecans depending on the area where they are selling. 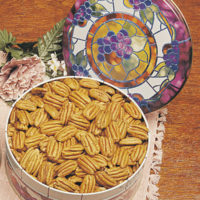 Whaley’s Fancy Shelled Pecans come ready to sell in attractive colorful one-pound polycel bags. They are packed 24 bags to the case. Half-pound cello bags and box packs are also available. 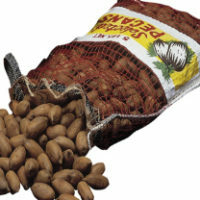 Bulk pecans are supplied in 28 or 30 pound cartons. All shipments to one address within the contiguous U.S. of 432 pounds or more are shipped freight prepaid. Shipments of less than 432 pounds will be shipped freight collect or freight prepaid with freight charges added to the invoice. We prepay the freight charges to the destination terminal. If there is a residential delivery charge, or other accessorial charges, the customer is responsible. We use the following methods of shipment depending on the size and destination of the order: Parcel Post, United Parcel Service, and Motor Freight Lines. Shipments from January through September are usually shipped within 24 hours of receiving your order. Orders during the holiday season are placed in line for shipment as we receive them and are shipped as soon as our new pecans are processed, usually one to three weeks. 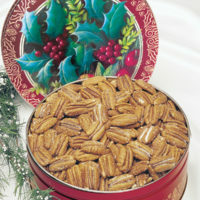 Pecans are packed and shipped immediately after shelling to insure they arrive “tree fresh” and ready for your enjoyment. During the warmer months, refrigeration is recommended to preserve freshness. New fall crop pecans should be stored in a cool, dry, odor free place to retain peak freshness and flavor. 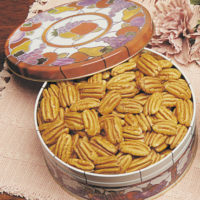 Do not store pecans for long in areas above room temperature. 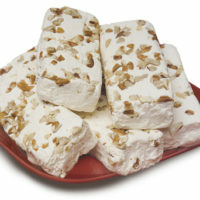 For home use, pecans can be frozen and thawed again and again with no harm done. Call or write us any time for current information. All of us at Whaley’s look forward to serving you and hope to hear from you soon.